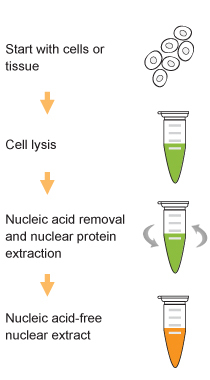 Schematic procedure for using the EpiQuik Global Acetyl Histone H3K14 Quantification Kit (Fluorometric). Specifically captures acetyl H3-K14 with the detection limit as low as 0.4 ng/well and detection range from 5 ng-2 µg/well of histone extracts. The control is conveniently included for the quantification of the amount of acetyl H3-K14. Acetylation of histones including histone H3 has been involved in the regulation of chromatin structure and recruitment of transcription factors to the gene promoters. Histone acetyltransfeases (HAT) and histone deacetylases (HDACs) play a critical role in control of histone H3 acetylation at multiple sites. Histone H3 at lysine 14 (H3-K14), along with K9 and K18 are primary acetylated sites of histone H3. Acetylation of histone H3-K14 is tightly involved in the cell cycle reguation, cell proliferation and apoptosis. Acetylation of histone H3-K14 is also correlated with transcription activation. An imbalance in the equilibrium of histone H3 acetylation including K14 acetylation has been associated with tumorigenesis and cancer progression. Histone H3-K14 acetylation may be increased by inhibition of HDACs and decreased by HAT inhibition. Thus quantitative detection of global acetyl histone H3-K14 would provide useful information for better understanding epigenetic regulation of gene activation and for developing HAT or HDAC-targeted drugs. The EpiQuik™ Global Acetyl Histone H3-K14 Quantification Kit (Fluorometric) provides a tool for measuring global acetylation of histone H3-K14. This kit is designed for measuring global histone H3-K14 acetylation. In an assay with this kit, the acetyl histone H3 at lysine 14 is captured to the strip wells coated with an anti-acetyl H3-K14 antibody. The captured acetyl histone H3-K14 can then be detected with a labeled detection antibody followed by a fluorescent development reagent. The ratio of acetyl H3-K14 is proportional to the intensity of fluorescence. The absolute amount of acetyl H3-K14 can be quantified by comparing to the standard control.